In the archives of a gentleman's club in this rural town is what is believed to be a signed copy of one of the most famous documents in the history of the Civil War. April 9, 1865. With his Confederate armies on their last legs, Confederate General Robert E. Lee surrenders to General Ulysses S. Grant. The Rebellion is over. After four years of fierce fighting, Confederate troops are persuaded to lay down their arms by a now legendary document. Robert E. Lee's farewell address, "General Order #9," also known as Lee’s farewell address, is composed at Appomattox, Virginia, upon the surrender of his troops in April 1865 and allows Confederate troops to retain their dignity in the face of a crushing defeat. 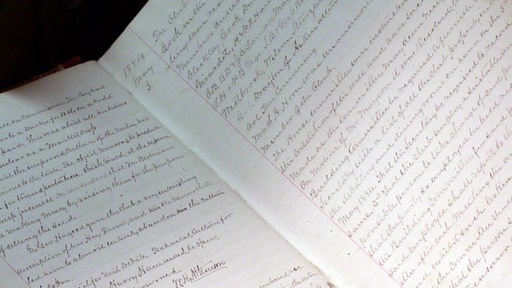 The Beech Island Agricultural Club, a social organization formed by local plantation owners in the 1840s, has owned this copy for almost 120 years. Now the group's membership chair and a descendant of one of the club's founders, has asked the History Detectives to find out if local lore is true — is this really the "original" copy of "General Order #9?" Blog Post: How do I authenticate a document? Also in Season 1 Japanese House How did a Japanese house come to be at the San Francisco World's Fair just months before WWII began? Also with Elyse Luray Bootlegger's Notebook Does this book belong to a Prohibition era bootlegger? Also in Season 1 Prison Plaque Were convicted felons responsible for bringing peace to Western Europe during World War I?